We'd missed our chance on Mount Arvon, but I was still determined to get one more of the state highpoints in before calling it a season. Examining the map, it looked like Backbone Mountain, the highest point in Maryland would be a fitting substitute, since it could be done in a day trip from our home in Pittsburgh. I invited our two oldest children to come along (ages 8 and 5) and the 3-year-old insisted that she be invited as well. Even though I knew that meant a longer hike, I couldn't relent, and we made our plans to visit Maryland's highest point. We picked a Saturday in August, and the mild weather we'd had all summer turned out to create the perfect day. We left Pittsburgh and started the 2.5-hour drive to Silver Lake, West Virginia. Backbone Mountain is an extended ridge over 30 miles long, and the actual highpoint of the ridge is somewhere in West Virginia. However, the highest point in Maryland is a point on the ridge just across the state line. 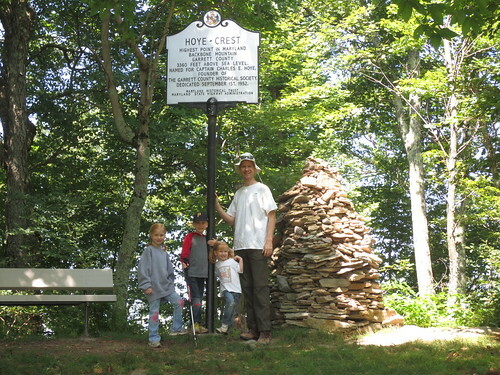 Our route would see us parking in West Virginia, climbing 700 feet to the ridge, and then crossing the state line to Hoye Crest, the actual highpoint of Maryland. Our drive through the windy roads of West Virginia was uneventful, and we found the trailhead off Route 219 just south of Silver Lake. The area is signed, and there is a pull off big enough for two or three cars to park at a time. Fortunately, there was only one other car there, so we got out, got our gear ready and the hit the trail. The route from the parking area to Hoye Crest is only a mile long, but gains 700 feet. It mostly follows a sun-dappled double-track dirt path to the top of the ridge, where the trail narrows and flattens. The route was conspicuously blazed up to the ridge with red "HP" signs and arrows, and once on top the signage continued. Our party's pace up the hill was fairly slow, owing to the pace and temperament of our 3-year-old member, but eventually we gained the top of the ridge. 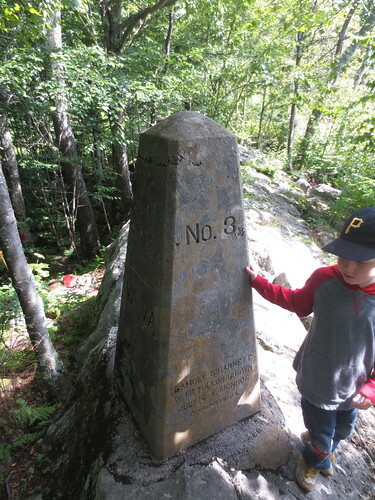 At the ridgetop, the trail turns north, and passes a 100-year-old granite obelisk marking the boundary between West Virginia and Maryland. Officially "Boundary Marker No. 3," the children enjoyed playing on and exploring it before we made the final 100-yard walk to the actual summit of Hoye Crest. The summit area had a sign, picnic table and good views into Maryland and the surrounding area, and we spent time there eating and taking a few pictures. Losing the cover of the mountain, the wind had picked up a bit, and sitting in the shade we wanted our jackets to keep warm. After having our fill of the area, we did a little bit of geocaching. We found one to the north of Hoye Crest, and didn't find one on near the state boundary marker. Our 3-year-old was starting to get a bit tired by this point, but the downhill walk back to the car turned out to be sufficient motivation for her to continue. We made it back to the car without incident and I took an alternate (and equally windy) route home, while the rest of the crew napped. We got home just in time for dinner. While not a large or awesome mountain by many standards, our trip to Backbone Mountain was a success by the most important ones: people had fun and we enjoyed being together as a family. Months later, our children still recount the "Backbone Mountain Expedition," and I suspect I'll be able to get them to come along when the time comes to conquer more exciting heights.